Color sealing your grout may be a recent innovation, but it is certainly not just a fad. Quality color sealers repel oil and water-based liquids, which will prevent food and beverage stains. In addition, they contain constant acting mildewcides and other agents that inhibit the growth of bacteria and mildew. This not only offers health benefits by making your floors more sanitary, but can reduce or eliminate the funky smells you often find with older floors that have had a long time to absorb a variety of odiferous liquids. Color sealed floors are consequently easier to maintain. Restore your dirty, stained and mildewed grout to like-new condition for a fraction of the cost of replacement. Replace moldy, yellowed, cracked caulking with fresh, commercial grade caulk that will protect your shower from damaging water leaks. No more wasted time scrubbing grout lines with bleach and harsh chemicals - with little effect. Patch missing or crumbling grout with new commercial grade grout. adhesive, or the backing board. appearance for many years to come. 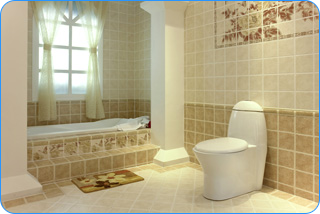 Call us at now for your free estimate and see how beautiful and clean your tile, grout and caulk can look again.